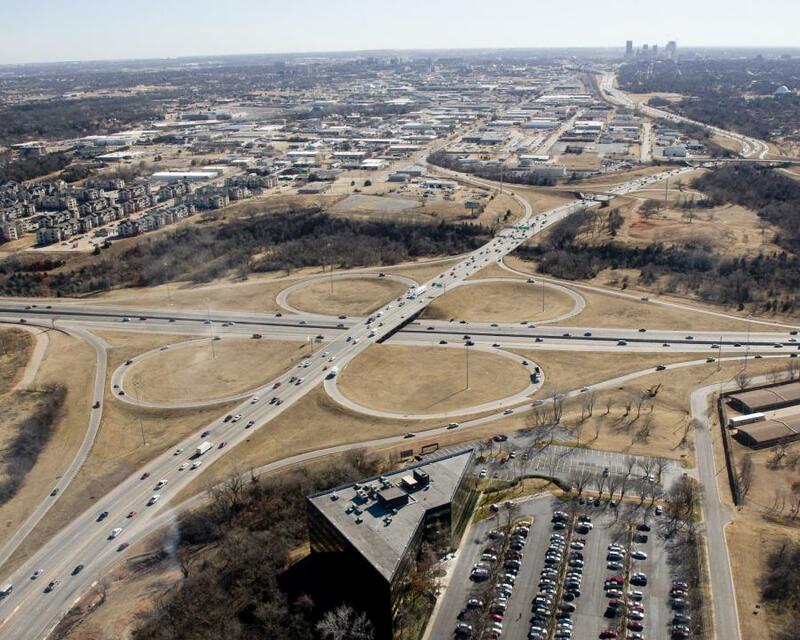 The I-235/U.S.-77 interchange at I-44 will be widened and reconstructed starting in spring 2019 after the award of an up to $105 million project by the Oklahoma Transportation Commission to Allen Contracting Inc. of Oklahoma City. Motorists should begin preparing their Off Broadway alternate routes before the next phase of the I-235/U.S.-77 corridor widening and reconstruction at the I-44 interchange in spring 2019. The Oklahoma Transportation Commission awarded an up to $105 million contract to Allen Contracting Inc. of Oklahoma City at its Dec. 3 monthly meeting. This contract amount topped the $88 million phase that just wrapped up in early November, making the new project the single largest dollar amount contract awarded in state history. It also represents the first four-level interchange constructed by ODOT on the state highway system. "This is an exciting project for many reasons, and by the end of construction the most important benefit to drivers will be the end of traffic bottlenecking at the I-235/I-44 interchange," said Mike Patterson, Secretary of Transportation and ODOT executive director. "Adding new lanes and building the two flyover ramps to more safely move traffic between the two interstates brings this corridor up to modern standards." The more than two-year widening project will bring I-235/U.S.-77 to six lanes plus auxiliary lanes at the I-44 interchange and work will take place on I-235 between N. 50th St. and N.W. 63rd St. Nearly 100,000 vehicles a day travel I-235 and a similar number uses I-44 in this area. the northbound I-235 off-ramp to N. 50th will close again to complete the ramp's widening and realignment as well as for the modification of the intersection at N. 50th St. and Santa Fe Avenue. The northbound I-235/U.S.-77/Broadway Ext. on-ramp from N. 50th is permanently closed to make room for the new northbound I-235 to westbound I-44 flyover ramp. "Motorists were incredibly gracious and understanding during the past two years by staying Off Broadway and using their alternate routes to avoid the construction zone on I-235 between N. 36th St. and N. 50th St. and now that it's open they should not get too comfortable using this route," said Terri Angier, ODOT spokeswoman. "This new project picks up right where we left off and is actually the most complex of all the seven phases to widen the corridor because it will impact traffic on I-235 and at times on I-44," she said. "We encourage motorists to again use their alternate routes and be patient while this necessary construction completes." The final act of the Off Broadway I-235 corridor widening is scheduled to take place in 2020 to reconstruct the westbound I-44 ramp to northbound U.S.-77/Broadway Ext. at an estimated $16 million. All work on the corridor widening is expected to complete by 2022.